I fixed the problem on my server by adding light pets to the forest spawn which makes it a little bit more lively. but that shouldnt be the ultimate fix. Same problem here. If I feed stuff as good as metal foundations, all I get is apprentice from a 200% CS Gacha. Gacha Baby Eating a Whole Stack? There are some theories around that the parents feed the babies with things in their own inventory. When the parents eat, the babies food goes up. However, it works with 4 of 5 gachas. So not really a super secure way. Base specs: NVIDIA GeForce GTX 970 Intel Core i7-4770K 16 GB RAM But it also happened to pretty much everyone on the server standing close to a drop or vein defense with 4-5 Velos. Also to people with super PCs that are a bit younger than mine. Usually, I have no real issue with ARK. But that's kinda weird. If that happens you have a few options to get your stuff back. 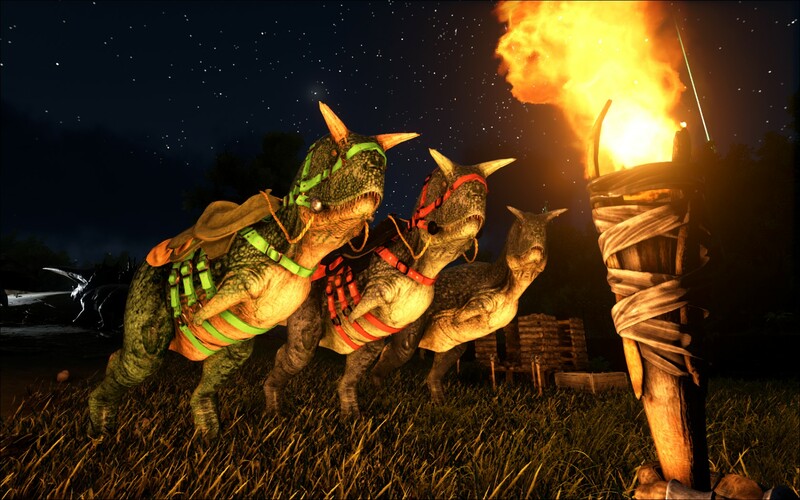 cheat TakeTribe <- gives you all the tribe structures and dinos cheat givetome <- gives you dino, structure you're looking at cheat GiveAllStructure <- gives you the ownership of the structure you're looking at and all connected parts not the most elegant way, but if you are the admin, the easiest way. Sometimes when Gachas had a fight they are untameable for a while. They will pretty much ignore everything you put down. Maybe thats the issue? Also I used a few Velonas here. But same issues with group 3 and up. Hello, to make it short, I experienced 2 issues with the Velonasaur on unofficial (not overly modded or boosted) First of all, as soon as several Velonas attack, it almost always causes the client to crash and disconnecting the players in render distance (had to forbid Velonas for Drop and Vein hunting ) Second, sometimes they get stuck into a slowed down run which happens super random. They can't be unstuck via whip. To show both detailed, I attached a video. The myth, the legend...is it real? After some breeding over the past days. this is our new member. So it is also possible via breeding. Please increase the amount of Creatures in the Sunken Forest! If you have it unlocked, use a chainsaw for farming meat. I have no meat problem since I switched to that method. We also have an Element Dust Gacha. Not sure how rare they are tho. I just tamed a bunch of low levels to check for the production wheel and kept the most useful for resources. Try using a Pachyrhinosaurus to deaggro it. It works for aggoed Gigantopethicus. They immediatly calm down. Even in a small pen.